Clifton House, Trewarmett - approx. one mile from Trebarwith Strand, two miles from Tintagel. 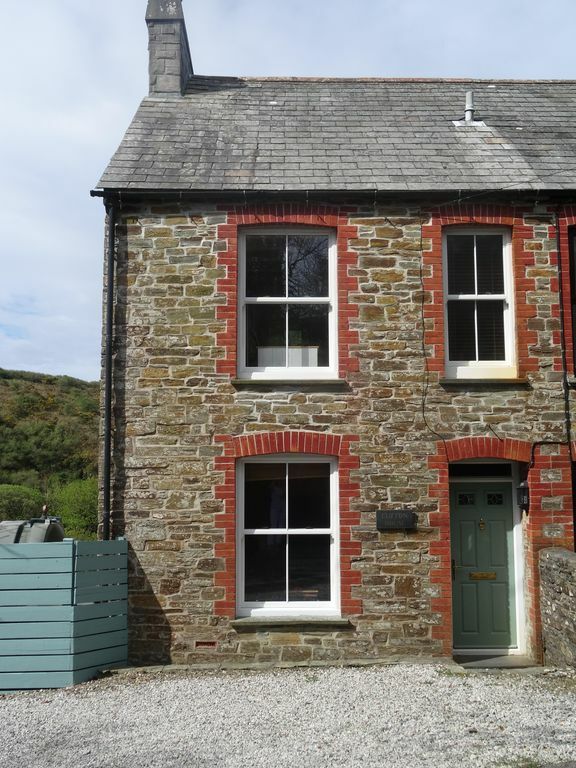 A Victorian house built from solid slate, it has been furnished to meet your expectations for a comfortable and enjoyable holiday while retaining many traditional Cornish features. Dogs are welcome. Clifton House has three bedrooms and is set over four floors comfortably accommodating six people. Electricity is included (and heating during autumn/winter months). Bed linen, tea and hand towels are provided, as are basic provisions. There is an internet connection at no charge. As you enter the house through the hallway, there is a large dining area which has a wood burning stove with the kitchen leading off it. The kitchen is fully equipped and has a fridge/freezer, microwave, cooker, dishwasher and washing machine. From the dining room, stairs lead up to the first floor. There is a twin room with superb views across the Trebar with Valley and a bunk bedroom with a 3ft top bed and a lower 4ft bed. Both bunk beds have adult mattresses ensuring a good night's sleep for children, teenagers and adults alike. On the second floor is a spacious double bedroom with plenty of storage and sea views. There is an en-suite wc and wash basin. Returning to the ground floor, stairs lead down to the sitting room. There is a further wood burning stove, a TV with DVD. The back door leads into a lobby and through to the garden. Extending over three levels, the garden offers plenty of space to hae fun, play games, enjoy a BBQ (provided), read or simply somewhere to sit and enjoy the view. As you enter the garden, there is a terraced area with table and seating. This leads to the games room which has a full sized football table. There is an array of buckets, spades, beach shoes etc which you are more than welcome to use whilst staying. In addition, there is a tumble dryer and a fridge to keep drinks cool whilst enjoying life outside. Leading on down, is another small terrace, with seating before you reach the main grassed area and a further terraced area with another table and seating. Clifton House is equipped for autumn/winter breaks too. We have an oil fired central heating system and a basket of logs are provided for the wood burning stoves for cosy winter days. Oil heating system during autumn/winter months. Wireless connection at no charge. Tea and hand towels only. Basic provisions such as tea towels, washing up liquid, dishwasher tablets, tea bags and sugar are provided. We also have two stair gates available for use. Great house, great location, lots of to see around.Great and professional hospitality from the owner. Thank you again!!! We've just had a great few days in Clifton House. Cornwall is always a super location what ever the weather and Clifton House was a great addition which was superbly equipped for all our needs. We are pleased to hear you enjoyed your stay at Clifton House and had a good break. Great house, well located, fab views and garden! My partner and I have recently returned from a fantastic 2 week stay (Sep 16) at Clifton House with our two mini-schnauzers. The house is a home from home and has all you could need for a very comfortable stay. It is as advertised and there have been some updates made since the pictures were taken. The house was very clean on arrival. The kitchen is well equipped with utensils/cookery items, as you would have at home and there is a big fridge freezer to fill with local ales and ciders (Tip: Myrings of Boscastle). There is a dishwasher, which always welcome on holiday. The dining room is a nice area with lovely views out to the garden and valley. There is a bookshelf here with cookery books etc and some great info on the local area i.e. leaflets, maps etc. On the 1st floor there are 2 bedrooms, well decorated and furnished. There is a family bathroom with bath, loo, sink and shower over the bath. All clean and very hot water to help soak away the days walking aches! On the 2nd floor is the master bedroom which is fab. Well decorated with a large comfy bed. There is an en-suite wc which is obviously very welcome. The view from the bedroom is fantastic, down the tree lined valley with sea views. The sunsets were magnificent. On the lower ground floor is a very comfortable living room with a modern tv, dvd player and freeview. There are a few lamps and added to the log burning stove, makes a very cosy relaxing area. The house is over 4 levels so there are quite a lot of steps, but you get used to them! The garden is a great area to spend some time. Set over a few levels, there are 3 different seating areas to enjoy. The dogs loved the lawned areas, with the odd rabbit popping out to say hello. There is a BBQ and firepit in the shed as well as a welcome fridge to keep the beers nice and cold. There was nothing better than sitting in the garden, watching the sunset over the valley!! The location of the house is great too and a good base to explore the local area, and there is a lot to explore! Bedruthan Steps is an absolute must if you like beaches and rugged coast! Go when the tide is out though!! Trebarwith is a fab beach too and highly recommend the Port William overlooking the beach, watching the sunset! Smashing place - get it booked! This is a real gem of a place. On arrival it looked small from the outside but once inside its so spacious. There are 3 bedrooms all good sizes and the beds are all really comfortable. One bedroom also has a half ensuite (sink and toilet) which is most appreciated if there is more than one family. The gardens outside are beautifully kept and our 2 dogs loved bounding around. Trebarwith Strand beach is not too far from here but it is a bit of a trek if you have all of your beach things with you. The Port William pub is also a little bit of a trek but well worth it for the views. There is ample parking outside the house for 2 cars and the owners are on hand for any queries. this really is a gem of a place id recommend to anyone. We will definitely be booking in again soon. The accommodation at Clifton House was excellent - well equipped and comfortable. The house has lots of character and the garden has lovely views over the valley. Family (and dog) friendly it is spacious and has lots of little extras that made it special - a great selection of books, dvd's, cd's, bbq. There is a lovely garden with plenty of seating with different areas to relax. The table football was fun too. The wine and milk on arrival was much appreciated. It is very convenient for Trebarwith Strand beach, the coast path and Tintagel. I would highly recommend. We have stayed at Clifton House for the last few years and have always had a wonderful stay - which is why we continue to book! Upon arrival the owners leave a small welcome pack (milk and wine) which is always much appreciated after a long drive. The house is in a quiet, peaceful location. The facilities at the house are modern and good quality. We have a German Shepherd so having a good size garden is important to us - and what a garden Clifton has! The house has plenty of room so if the weather is bad (unfortunately this is the only uncertainty holidaying in Britain!!) at least you aren't stuck for space. There is also a football table in the games room which is fun! There is a BBQ provided which we use while staying. The owners are always helpful when making booking enquiries and are a phone call away if needed on holiday. The housekeeper is also available if needed. The information pack included at the house has all the info you will need. Trebarwith beach is a 5 minute drive and there are good pubs nearby. The beach shops are good and the owners friendly. Trebarwith beach is also dog friendly. Tintagel is nearby (10 minute drive) and offers a variety of local shops. We would recommend staying at Clifton House and we are booked for 2013 and are looking forward to being back at this relaxing spot! Trebarwith Strand is approx. a mile from the house and can be reached by road or on foot via road and the coast path or across the fields. Whichever option you choose, distinctive Gull Rock is never far from view. Trebarwith Strand, on the Atlantic coastline is a superb expanse of sandy beach with rock pools, caves and exhilarating surf, it is a dramatic sight throughout the year. Surf lessons are available a the surf school which operates in the summer. Alternatively, Polzeath has surf schools operating throughout the year. Trebarwith Strand offers much more than simply the sea. Indulge your creativity by making spectacular sandcastles or try your hand at crabbing in the rock pools. At low tide, the beach is perfect for a stroll or walking the dog (who are welcome on the beach all year round). Scrabbling over the rocks or exploring the caves, there is lots to do. When refreshment is needed, there is the Port William pub on the cliff edge overlooking the beach. Or the two cafes which serve drinks, good food and delicious doughnuts. In addtion, there are three shops for gifts, ice-creams and everything you need for the beach including board and wetsuit hire. Other beaches within easy driving distance include Polzeath, Daymar Bay, Bude and Widemouth Bay. There are a wealth of things to do in North Cornwall. At the house, there are many information leaflets to assist you in making the most of your holiday be it participating in the dozens of activities available, eating & drinking or sightseeing. Here is just a taste. Surfing, body-boarding, coasteering, fishing, sailing, windsurfing, waterskiing, wakeboarding, paddleboarding, canoeing are some of the many water based activities possible in the area. The North Cornwall Coast is simply stunning with fabulous walking all along the coast. From the house itself, there are several good walks - the area map in the hall will provide you with more information and help in locating places. The Prince of Wales Engine House is just up the road and a short picturesque walk to the top is a must to enjoy the view of the coast. Near Camelford (a short drive away) on the edge of Bodmin Moor, there is Rough Tor and just beyond it, Brown Willy, the highest point in Cornwall. Just a mile away is Tintagel, the legendary home of King Arthur. Tintagel Castle, the National Trust's Old Post Office and King Arthur's Great Hall are just a few of its attractions. There is a wide selection of cafes, restaurants, pubs, takeaways and gift shops. In addition, there is a butcher and two small supermarkets. Or there is Boscastle with its picturesque harbour and the pretty fishing village of Port Issac where you can buy fresh fish, including crab and lobster. Polzeath, Wadebridge and Padstow are all worth a visit. And whilst a cornish pasty is always a must, there are also many excellent restaurants and pubs nearby and slightly further afield, catering for all tastes and price ranges. There are historic houses and gardens including Lanhydrock, Pencarrow and Prideaux Place. Horse riding is available both locally. On nearby Bodmin Moor see the wild ponies and stunning moorland. Cycling across the moor is also an option and bikes are available for hire. The Eden Project and The Gardens of Heligan are less than an hour away. Cycling along the Camel Trail is a must. Car free for 17 miles, you can hire bikes at Wadebridge and cylce to Padstow along the Camel estuary or inland towards Bodmin. If you enjoy golf, there are several courses within a 30 minute radius, including the excellent Bowood Golf Club (10 mins) and St Enodoc Golf Club. In addition, there are numerous festivals and events happening all year round. There are also many art galleries catering for all tastes including the Tate Gallery at St Ives. Please note all bookings are generally Saturday to Saturday. However, for Easter, Christmas, New Year, bank holidays and short breaks, please contact us directly as there will be flexibility in respect of changeover days and minimum stay requirement. Prices and minimum stay are a guide for the period specified; please contact us directly if you are interested in a shorter break.